Oddball black holes that spin backward in theopposite direction of their surrounding debris discs appear to create morepowerful jets of radiation than their regular-spinning brethren, a new studyhas found. The finding could change scientists?understand of how galaxies evolve since the development of stars depends on the radiationejected from the supermassiveblack holes anchoring their home galaxies. A lot of what happens in an entire galaxydepends on what's going on in the miniscule central region where the black holelies," said the study's lead author David Garofalo, a theoreticalphysicist at NASA's Jet Propulsion Laboratory (JPL) in Pasadena, Calif., in astatement. The black holes can spin either in the samedirection as the disks, called prograde black holes, or against the flow,called retrogradeblack holes. For decades, astronomers thought that the faster the spin ofthe black hole, the more powerful the jet. But there were problems with this"spin paradigm" model. For example, some prograde black holes hadbeen found with no jets. "Jets transport huge amounts of energyto the outskirts of galaxies, displace large volumes of the intergalactic gas,and act as feedback agents between the galaxy's very center and the large-scaleenvironment," said Rita Sambruna, a researcher at NASA Goddard SpaceFlight Center, and an author of the new paper. "Understanding their originis of paramount interest in modern astrophysics." The scientists say that backward black holesshoot more powerfuljets because there's more space between the black hole and the inner edgeof its orbiting disk. This gap provides more room for the build-up of magneticfields, which fuel the jets, an idea known as the Reynold's conjecture afterthe theoretical astrophysicist Chris Reynolds of the University of Maryland,College Park. 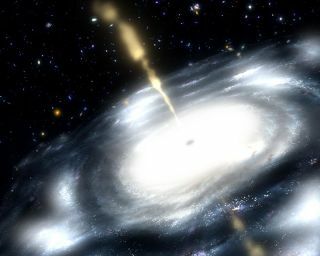 The new results showed that more distantradio-loud galaxies are powered by retrograde black holes, while relativelycloser radio-quiet objects have prograde black holes. According to the study,the supermassive black holes evolve over time from a retrograde to a progradestate. The research is detailed in the May 27 issueof the Monthly Notices of the Royal Astronomical Society. "This new model also solves a paradox inthe old spin paradigm," said theoretical astrophysicist David Meier, aresearcher at JPL who was not involved in the study. "Everything now fitsnicely into place."